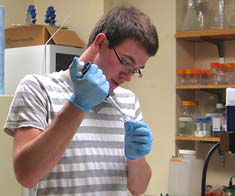 Aaron M Freed, Volunteer Undergraduate, genotyping mice. 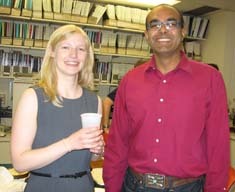 Professor Vijay Balasubramanian (right) and Dr. Kristina Simmons on the occasion of her successful thesis defense. 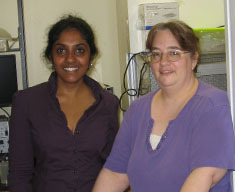 Postdoctoral Researcher Shanti Tummalla (left) and Research Specialist Marie Fina. Schematic representing a computational model of a ganglion cell (red) with its presynaptic bipolar cells (yellow) and their presynaptic cone photoreceptors (blue). 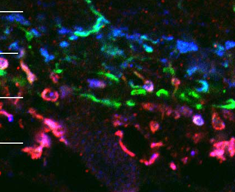 Bipolar cells expressing a green fluorescent protein under control of the promotor for the mGlur6 receptor. 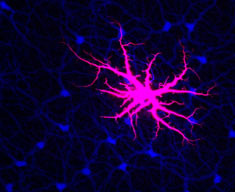 Horizontal cell (magenta) and cone photoreceptors (blue). 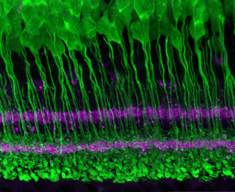 Inner plexiform layer of retina in which ON bipolar cells express a green flourescent protein under control of the promotor for the mGlur6 receptor. 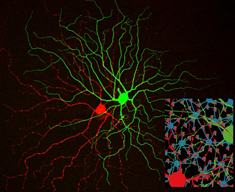 Phosphokinase C (red) and Purkinje cell protein 2 (blue) are tagged with fluorescent antibodies. Most ON bipolar cells contain Purkinje cell protein 2 but one type, CB7, does not. A pair of OFF alpha cells filled with red and green fluorescent dyes. 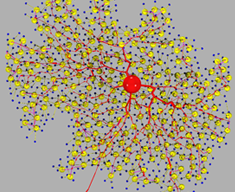 Inset shows a computational model of the two cells' common synaptic inputs.